A civil engineer at Purdue University is taking advantage of the demolition of a bridge spanning the Ohio River to learn more about how bridges collapse in efforts to reduce the annual cost of inspecting large spans. Modern analysis techniques, however, could be used to learn whether such bridges really are fracture-critical, or whether other structural elements would share the load if a major piece failed. A Purdue University Release reports that to test his hypothesis, Connor will purposely damage an approach span leading to the Milton-Madison Bridge in southern Indiana. The 82-year-old bridge, on U.S. Route 421 connecting Milton, Kentucky, and Madison, Indiana, is being demolished in stages. A replacement bridge is scheduled for completion in 2012. 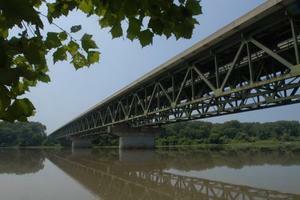 Federal law requires that the fracture-critical bridges be inspected every two years. Workers must perform a detailed “hands-on” inspection of such spans. Connor suggested piling a load of sand onto one of the approach spans to simulate the weight of trucks and then cutting a critical member of the bridge with an explosive charge. He took his idea to an engineering consultant, Michael Baker Corp., and general contractor Walsh Construction, as well as officials from the Federal Highway Administration and Indiana and Kentucky state transportation departments. The proposal was approved and federal funding provided. Connor and his team of research engineers and a student have fitted the 100-foot approach span with 50 sensors and will damage a portion of the span and record the findings. The researchers will take high-speed video in addition to recording sensor data. The test is tentatively set for mid-August. “We expect to be able to show whether, if one piece fails, the whole bridge won’t fail because there are secondary load paths that kick in,” said Connor, who has been involved in numerous steel bridge failure investigations, the most recent being the 2007 I-35W Mississippi River bridge collapse in Minneapolis. Connor believes it is the first study of its kind on a truss bridge that is in place. As part of the fracture-critical work, Purdue researchers also will test steel members from the bridge at Purdue’s Robert L. and Terry L. Bowen Laboratory for Large-Scale Civil Engineering Research.